Cyber-crime and various types of malware are on the rise so there is no way to keep your computer safe without using an antivirus software. 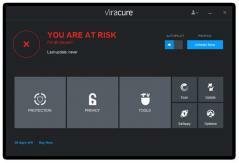 Viracure is such an application, and it can reliably protect your PC while you’re downloading applications and other types of content, browsing the web or transferring files from external drives and optical discs. The application comes with customizable vulnerability level for its malware protection module, which you can set from permissive to aggressive. Nevertheless, users do get the option to further tweak on-access scanning using features like custom whitelists and exclusions but also a quarantine area where potentially malicious files can be safely stored. Besides the antivirus module, Viracure bundles numerous optimization tools like a registry cleaner, disc cleaning and defragmenting, one-click maintenance, Registry cleaning and recover and even a function to detect duplicate files. Aside from that, the program offers a Wallet which allows you to safely store the credentials you use to make online purchases. With the customized Wallet, the tool will automatically fill in login and payment information, in a way that doesn’t make them vulnerable to keyloggers. What’s more, you can choose to lock your wallet when your computer remains unattended or to ask for a master password at system boot or when it needs to be used to ensure no unauthorized individual will be able to use it in your absence. Smart PC clean-up with just two clicks!